September 23, 2013: Happy birthday, JC. Hello Jeffrey and Jeffrey. My first jazz record. Coltrane Jazz by....... First track Little Old Lady by Hoagy Carmichael. The sort of record you play and know that you have a friend for life. Good morning, Jeffs and Brian. howdy gents, and hello jeff and jeff! Roll call! Helloooo Brian, Carmichael, James! I like to think of D:O Radio as the "Geoffrey Ballet." this is wonderful walking-the-daughter-to-school weather here across the rivers in westwood, nj. I seem to be here. Seems we're two Mutts shy of a comic strip 'round here. It is raining like fury here. Doug Schulkind in the house. fred also in this house! pacific standard simon, all (above and) aboard! True nuff, Artie. Was Mutt the short one? Needless to say, Doug, we're dancing as fast as we can. If it's raining cats and dogs, Simon, don't step in a poodle. Jeff is the short one. Mutt is the sophisticate. Jeff was the short one. Ok, got it. Maybe in this case, two Jeffs equal one Mutt? The smell of freshly picked apples and bread baking permeating the airways in this house. Or should it be manifesting? Either way, I would enjoy an offering, Brian. Going to be following this show as much as I can. Brian in the UK, thanks for the tip (at the end of Liz's playlist). We have some delicious Autumn Chutney and Plum Jam made only this weekend. Would that I could put some your way. @Parq we cannot have people tuning to another station. Appreciate the cross-show recommendations, Brian! And welcome @Parq, for as long as you're available! This cut, "Offering," was recorded only months before JC died. He was suffering. Though I don't hear suffering. This strings section of Peace on Earth always makes me think of a Disney anthem. In the best possible sense. walking in the woods cost me the first half hour of do:radio. stupid nature. Hey, @hyde! Nature's cool. That's why we have archives. Nature's call for my dogs! @Doug Dan Bodah's show looks like fun tonight with Gary Lucas performing some 1930s Chinese pop. He is also doing live shows. Not in this manor though. @Jeff nature *is* cool. anyway, all I missed was a bunch of stuff by some guy I've never heard of. Gary Lucas is a treasure. Dan Bodah is a treasure. Nice combo. Gary Lucas as a wonderful new solo record, just out or soon out. Will play something from it! This is awesome! Unfortunately, I need to eat. Be back soon! @northguineahills: thanks for checking in! Come back soon. That's funny, b/c Irene was also playing JC. Parallel? Really? I think the WFMU universe is decidedly non-Euclidian. it is large, it contains multitudes. Doug/LJfW/hyde: Agreed, though was just trying to steer someone back to the clearing. Reminds me of my high school yearbook quote -- yes it WAS e. e. cummings so you can stop snickering -- "There's a hell of a great universe next door. Let's go." Universe, universe, chorus, bridge, universe. The WFMU universe is one of those dimensions that Dr. Strange accesses. I'm going to try and make it all the way through Ascension tonight. WFMU's amEdeo will be filling in for Tony Coulter tomorrow. Ted Barron will be filling in for Matt Fiveash on Thursday. Now you tell me, Doug. Will there be a Tuesday night Ken's Last Ever after Kaminsky? @UM: Let us know how it goes! Brian, that's not what I was asking about. Apologies Simon do not understand your banter. There was one week when there was a Kenzo Tuesday show, and some indication that this would happen every other week. This is the best baba ganoosh I've ever eaten and I *bought* it. Tomorrow evening, after the regularly scheduled broadcast of Give the Drummer Some, I will continue on the air for two more hours, filling in for Jesse Kaminsky's program, Kaminsky Kamoutsky. 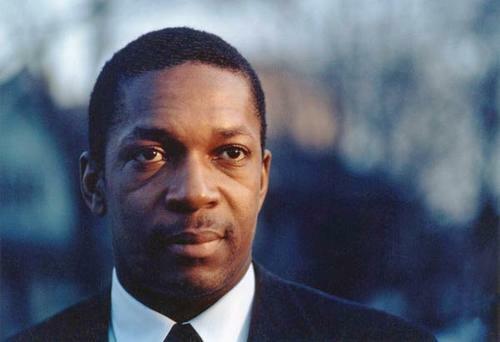 The show will run for three continuous hours beginning at 6pm and will present the final three (of five) hours of the spectacular John Coltrane radio documentary TELL ME HOW LONG TRANE'S BEEN GONE, created and produced by Steve Rowland. This program will not be archived. You must tune in between 6 and 9pm to hear it. You should hear this in Dobbbly. aw, man. I'm going to miss that, darn it. Ken's Last Ever Radio Extravaganza airs every other Tuesday night, 11-1 in an unannounced broadcast on the Drummer Stream. That every-other-weekly show is then aired again the next day in its regular slot, Wednesday, 2-4pm. On the in-between weeks, the show only airs during the Wednesday slot. To answer your question, YES, Kenzo will (I think) be on tomorrow at 11p (ET). So sorry for the last-minute announcement. This all just came together in within the hour. Time to shuffle aome comestibles. Nice one Jefferies. Thanks, as ever, for hanging with us, Brian! Good evening to you! jeez, now I'm talking to myself? I gotta get out more. all of emily dickinson's poems can be sung to the tune of the battle hymn of the republic. try it. it's fun. @fred: Yes, agreed. Need to check out more of his stuff. @glenn: I'm gonna take your word for it. Do they also align perfectly with Dark Side of the Moon? thanks, jeff, for the fine show and the mighty coltrane tribute! Thanks for the birthday party, Jeff. Thanks, @fred; @ljfw; @hyde; @UM -- a pleasure!